The bush vlei rat or Karoo bush rat (Myotomys unisulcatus formerly Otomys unisulcatus) is a species of rodent in the family Muridae. It is found in Namibia and South Africa. Its natural habitat is temperate shrubland. The Karoo rat uses behavioral adaptations to cope with the dry arid climate. It is a medium-sized rodent with a dark pellage on top and lighter underneath. It has light colored feet and a dark tail. The rat may have light colored fur around its eyes and the back of its ears. The Karoo bush rat can be found in the semi-deserts of South Africa. These deserts have extreme temperature fluctuations ranging from below 0 °C (32 °F) in the winter to over 40 °C (104 °F) in the summer. 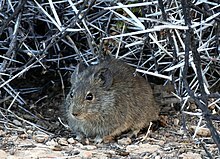 The Karoo bush rat unlike most rodents creates a refuge made of interwoven sticks and is sited on the surface. These stick lodges are found in the shrubs of the desert. They can be over 1m tall and there is only one lodge per bush/shrub. These stick lodges offer protection against the extreme climates, predators, and also a physiological refuge. The temperature variation in the nests are significantly less than the surrounding ambient temperatures with the temperature in the winter being about 4 °C (39 °F) higher inside the nest than outside and 14 °C (57 °F) lower during the summer than the outside temperatures. In the family Muridae the Karoo bush rat has a strong correlation between reproduction, the abundant resources, and the occupation of the stick lodges. Myotomys unisulcatus has very rapid postnatal development and small litters of semi-precocial young. The average litter size is two to three. Weaning begins at eight days of age and reproduction can begin at six weeks for males and five weeks of age for females. The Karoo bush rat is limited in diet due to its dry and arid climate. They are considered herbivores, eating foliage and succulent stems from 60 different plant species. In the winter they consume mostly succulents, in the spring they consume an even mix of succulents, non-succulents, and annual vegetation. In the summer and fall months they consume succulent and annual plants evenly. To gather food they bite off lengths of vegetation and drag them to the entrances of their stick refuges where they will consume the resources gather. ^ Taylor, P.J. ; Monadjem, A. (2008). "Otomys unisulcatus". The IUCN Red List of Threatened Species. 2008: e.T15662A4973912. doi:10.2305/IUCN.UK.2008.RLTS.T15662A4973912.en. ^ a b Pillay, . "Reproduction and postnatal development in the bush Karoo rat Otomys unisulcatus (Muridae, Otomyinae)." Journal of Zoology, . Accessed 31 Oct. 2016. ^ Jackson, . "Alternative refuge strategies and their relation to thermophysiology in two sympatric rodents, Parotomys brantsii and Otomys unisulcatus." Journal of Arid Environments, . Accessed 31 Oct. 2016. ^ Du Plessis, A.; Kerley, G.I.H. ; Winter, P.E.D. (1991). "Dietary patterns of two herbivorous rodents: Otomys unisulcatus and Parotomys brantsii in the Karoo". South African Journal of Zoology. 26 (2): 51–54. doi:10.1080/02541858.1991.11448231. ^ Shradin, Carsten. "Nest-Site Competition in Two Diurnal Rodents from the Succulent Karoo of South Africa." Oxford Journals, . Accessed 31 Oct. 2016. ^ Kerley, Graham I., and Theunis Winter. "Fire and the Range Limits of the Bush Karoo Rat Otomys unisulcatus." Global Ecology and Biogeography Letters,, vol. 2. Accessed 31 Oct. 2016. Musser, G.G. ; Carleton, M.D. (2005). "Superfamily Muroidea". In Wilson, D.E. ; Reeder, D.M (eds.). Mammal Species of the World: A Taxonomic and Geographic Reference (3rd ed.). Johns Hopkins University Press. p. 1524. ISBN 978-0-8018-8221-0. OCLC 62265494.